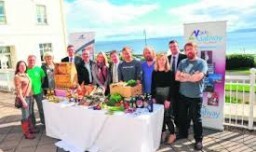 Galway was officially announced as a candidate to become designated European Region of Gastronomy 2018 last Tuesday at a stakeholder briefing attended by in excess of 100 participants in the Galway Bay Hotel.The briefing was addressed by a number of key speakers and included a workshop which will inform Galway’s bid to become the European Region of Gastronomy 2018. Five key focus areas were prioritised by participants at the event and these will inform the development of the Bid Book. The areas prioritised are Education, Health, Supporting SMEs and Innovation, Cultural Diversity and linking Urban and Rural.